On this date in 1944, Hannah Szenes was shot by the Nazis in her native city of Budapest — a city she had left five years before, and to which she had returned as a British special operative. 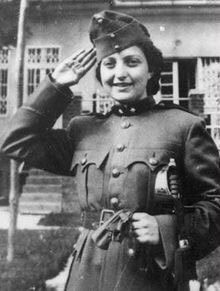 Hannah Szenes (alternatively, “Chana Senesh” or “Hannah Senesh”) grew up in interwar Hungary. Reaching adulthood in a period of rising anti-semitism in the late 1930’s, she became a Zionist and emigrated to British-controlled Palestine. But with the onset of war, she signed up with the British Special Operations Executive and was parachuted behind German lines in March 1944. Her brief: to save both Jews and downed Allied pilots. It is often described as the only military expedition to relieve European Jewry during World War II. And it was as dangerous as it sounds. Hannah was nabbed crossing into Hungary on a mission that her colleagues (rightly, it seems) deemed too perilous to attempt, and withstood months of torture without divulging her codes. By the time she went in the dock for treason, Nazi control of Hungary was collapsing and judicial administration itself was breaking down to the timpani of falling shells. Her sentencing November 4 was postponed; on November 7, an officer peremptorily informed her that she had been condemned to death. It’s believed that she was actually never formally sentenced, merely mopped up ahead of the unstoppable Red Army, which on this very day first entered Budapest’s suburbs. A writer as well as a fighter, Szenes’ poetry survived as her monument to life — like the present-day Israeli standard “Blessed is the Match”, also the title of the documentary excerpted above; and, her “Halikha LeKesariya” (“A Walk to Caesarea”), also known as “Eli, Eli” (“My God, My God”). Here it is sung by Regina Spektor. One – two – three … maybe another week. Pingback: Jewlicious » Haveil Havalim #190 - Post Election Panic!